A growling list of companies are capitulating, announcing production cuts for 2016. Continental Resources, for example, could see output fall by 10 percent. A range of other companies has made similar announcements in recent weeks. The energy world has been speculating about declines from U.S. shale, and the declines are finally starting to show up in the data. Despite the newfound optimism, that oil markets are balancing out, crude oil sitting in storage is at a record high in the United States. Energy investors may have preferred to focus U.S. production declines, or the fall in gasoline inventories in early March, but meanwhile crude oil stocks continue to signal that oversupply persists. 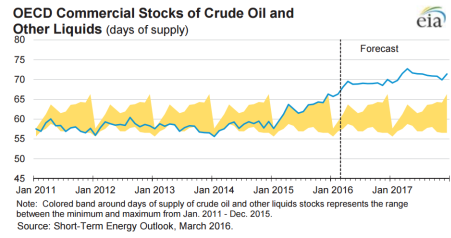 "With large global oil inventory builds expected to continue in 2016, oil prices are expected to remain near current levels," the EIA concluded in early March. The EIA lowered its price forecast for Brent by $3 per barrel, expecting it to average $34 for the year. Next year does not look much better: the EIA sees Brent prices averaging just $40 per barrel next year, a whopping $10 lower than what the EIA predicted last month. That could mean prices stay below $50 per barrel through 2017. Price forecasts are always wrong and often wildly off the mark. While it is difficult, if not impossible, to accurately predict price movements, especially a year or two out, it is impossible to argue with the sky-high levels of oil sitting in storage. Even if U.S. oil production continues to decline, the greater than 500 million barrels of oil inventories – a record high – need to start declining in a substantial way before the oil markets will see a sustained rally.